Although these camps varied in size, shape, and purpose, they were typically constructed in the shape of a rectangle with rounded corners and were protected by a small ditch and a small earthen rampart (presumably made with the displaced earth from the ditch) lined with stakes2. These temporary camps are categorized by Rebecca Jones into four types3. The first and most common — marching camps — were used to protect an army while away from a permanent base campaigning or conducting other military operations. These camps were constructed by the Romans at the end of a day of marching or conducting other operations in the field4. The second most commonly found type of camp is the construction camp, which appear to have housed troops building larger, more permanent fortifications. There are several proposed construction camps in Scotland, many of which are located near the Antonine Wall, but they can be difficult to distinguish from other camps. Even less common are siege camps, which were used to house troops besieging a nearby fortification (of which there is only one proposed site in Scotland, at Burnswark), and practice camps, constructed as part of training exercises (of which there are no firmly proposed sites north of Hadrian’s Wall5. 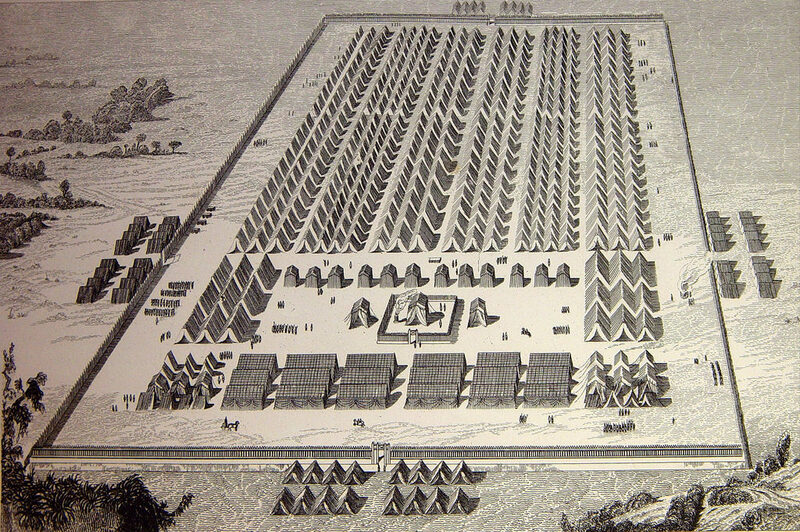 “Un acampamento romano en tiempo de la invasión romana en España” — an artist’s interpretation of a Roman marching camp, from an 1852 history book by Florián de Ocampo, provided by Fondo Antiguo de la Biblioteca de la Universidad de Sevilla via Creative Commons. Most of what we know about these temporary camps comes from a combination of what we can glean from the writings of ancient historians, military manuals authored during the time of the Roman Empire, and information from the sites of the camps themselves, studied via aerial survey or archaeological excavation6. One notable exception to this is a more visual and artistic source — the column of Trajan in Rome contains several artistic depictions of Roman camps under construction7. Of these sources, two of the most detailed in their descriptions of these camps come from military manuals. One of these manuals is known as the Epitoma Rei Militaris, written by Vegetius sometime in the late 4th century AD. His point of view is interesting in that he appears to be writing a guide on how to fix the Roman army of his day, apparently as advice to an emperor of disputed identity, rather than a history of the Roman military’s practices. Vegetius seems to have been some sort of court official, and “there is little evidence that he himself was a soldier,” but he does not seem to position himself as anything other than that8. 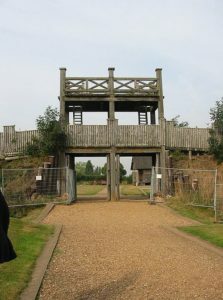 Main entrance to the Lunt Roman Fort (reconstructed) near Coventry, England. Photo by Chris McKenna19 . Another, even more detailed manual covering the construction and placement of Roman camps is the de Munitionibus Castrorum, likely written by an military surveyor whose name is disputed — he is sometimes called Pseudo-Hyginus12 because the work has been attributed to Hyginus Gromaticus in the past13. Beyond these two sources, there are of course other ways to glean information about the Roman temporary camp. Other literary sources, while often very detailed, typically do not focus specifically on camps or their placement — for more information on these sources, I would recommend Chapter 2 of Catherine Gulliver’s thesis The Roman Art of War (see notes below). Survey reports are also useful for studying the temporary camp — examples of these can be found on the Citations page. Maxwell, Gordon S., The Romans in Scotland (Edinburgh: J. Thin, 1989, Print): 38-39. Breeze, David. J., The Roman Army (New York: Bloomsbury Academic, 2016, Print): 111-112. Jones, Rebecca H., Roman Camps In Scotland (Edinburgh: Society of Antiquaries of Scotland, 2011, Print): 7. Goldsworthy, Adrian K., The Complete Roman Army (New York: Thames & Hudson, 2003, Print): 169-172. Jones, Roman Camps In Scotland: 7-12. Maxwell, The Romans in Scotland: 38-67. Jones, Roman Camps In Scotland: 7. Stelten, Leo F, translator, Epitoma Rei Militaris By Flavius Vegetius Renatus (New York : Peter Lang, 1990, Print): XIII-XVIII. Stelten, Epitoma Rei Militaris: 45. Jones, Roman Camps in Scotland: 5. Gilliver, Catherine M., The Roman Art of War: Theory and Practice. A Study of the Roman Military Writers (London: University of London, University College London (United Kingdom), 1993, ProQuest, Web): 14. Gilliver, The Roman Art of War: 14. Maxwell, The Romans in Scotland: 26-37. Gilliver, The Roman Art of War: 244. Chris McKenna (Thryduulf) [CC BY-SA 4.0 (http://creativecommons.org/licenses/by-sa/4.0) or CC BY-SA 3.0 (http://creativecommons.org/licenses/by-sa/3.0)], via Wikimedia Commons.